Have you ever used the term “Breath Taking” in reference to a Golf Course? My breath was literally taken away, followed by a moment of silence, (which is very uncommon for me); as I scanned the former phosphate mine, which is now home to Streamsong Resort. Located in Ft. Meade, FL, which is 47 miles from Tampa Bay and 83 miles for Orlando. This 37 hole course (number 37 is the tie-breaker hole) isn’t your ordinary country club course; it has two unique 18-hole designs, identified as, “Red” and “Blue.” Streamsong’s golf course blueprint was constructed by renowned golf architects Tom Doak (Blue), Bill Coore and Bill Crenshaw (Red). Doak’s vision for the course consists of multiple elevation changes, a number of ponds and large bunkers. The Red course features Bermuda grass fairways, sand dunes, lakes and natural bunkers. 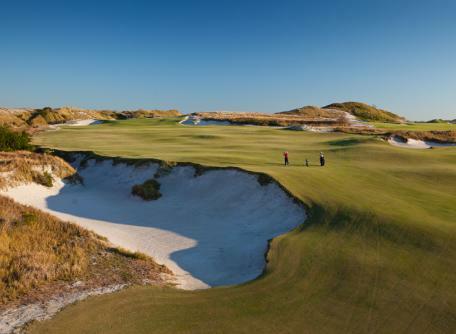 This hidden gem is receiving recognition worldwide; Streamsong Resort was awarded as the “Best New U.S. Course You Can Play,” in 2013 by Golf Magazine. In addition to the tie breaker hole, each player is paired with a walking caddie and/or forecaddies (rates vary); these caddies at are very skilled, many of them carry two bags at a time (single bag caddies are available). Forecaddies are available to guide players through the course route, offer advice on yardage and putts, and assist bunker care. For those who like who love good food and relaxation, Streamsong has something for you also. The spa is a spacious sanctum, providing services and products that will ease your mind, body and soul. And for the “Foodies,” if you are looking for food experience that will satisfy your palette with a splash of culinary creations; Streamsong should be your next dining experience.